2 International Academy of Orthopedic Medicine – United States, Tucson, Arizona, USA. 3 Center for Rehabilitation Research, Texas Tech University Health Sciences Center, Lubbock, Texas, USA. Temporomandibular disorders (TMD) are multi-faceted conditions physical therapists treat through strengthening and motor control exercises, as well as manual therapy to the joint system. There is a paucity of research on total temporomandibular joint (TMJ) arthroplasty in conjunction with physical therapy (PT) treatment. This case report discusses the evaluation and treatment of a 39-year-old female with a 3-year history of TMJ pain after wisdom teeth extraction, and arthrocentesis intervention followed by total right TMJ arthroplasty. The patient presented with restricted jaw motion as well as symptoms in the jaw, head, face, neck, and right upper extremity. She reported a history of a motor vehicle accident (MVA) prior to her surgery, which complicated her symptoms and recovery. PT treatment consisted of manual therapy, modalities, therapeutic exercise, motor control, and sensorimotor retraining targeting her cervical spine as well as jaw motion control. The outcome measures utilized were quality of life and biopsychosocial factors (measured with the Oral Health Impact Profile (OHIP) for TMDs), amount of mouth opening (measured in mm), and pain intensity (measured by the Numerical Pain Scale and Face Rating Scale). Treatment of this particular joint system, as with any joint with an artificial component, changes within the parameters of the surgical contra-indications; however, the sensorimotor control component of treatment remains and should be challenged. It is the aim of this report to present treatment unique to this patient population. Most agree surgical intervention should be a last resort for this patient population.7,8 A systematic review by Johnson et al found, when reported, most patients who agreed to undergo a TMJ arthroplasty had sustained a minimum of 2 failed surgical interventions.9 It is standard to have 3 components with each replacement: 1) a condyle and ramus component, 2) a fossa component, and 3) the screws to hold each component into place. Some fossa components are made of ultra-high molecular weight polyethylene, which is not visible on imaging (Figures 1 and 2).9 Currently, there is no defined regimen of PT treatment and exercises in the literature for a TMJ arthroplasty. The purpose of this case report is to 1) communicate the effects of treatment which included sensorimotor control exercises and manual therapy for a patient following total TMJ arthroplasty, and 2) add to the slowly growing body of literature on this unique diagnosis. A 39-year-old female, self-referred to PT, began treatment following right TMJ arthroplasty of both condyle and fossa components in April 2017. She presented to therapy with a 3-year history of facial pain following bilateral wisdom teeth extraction in January 2014 which resulted in right jaw pain. Because of this lingering pain, she underwent right TMJ arthrocentesis where bony fragments were removed in May 2014. She reported symptom reduction for 2 weeks after this procedure. She underwent an unsuccessful arthrocentesis, surgical attempt to reposition the TMJ disc, and wearing a night guard; none of which reduced her jaw pain. During this time, she received massage treatments, dry needling, and physical therapy. In the spring of 2016, she was involved in an MVA with a concussion diagnosis and onset of right arm pain and paresthesias. Following the MVA, she noted vision problems and numbness at the back of her head. Further, she noted progressive worsening of her neck and jaw pain after the MVA. In the Fall of 2016, she underwent a radiofrequency ablation at the C2-3 and C3-4 levels prior to PT, with short-lasting relief. 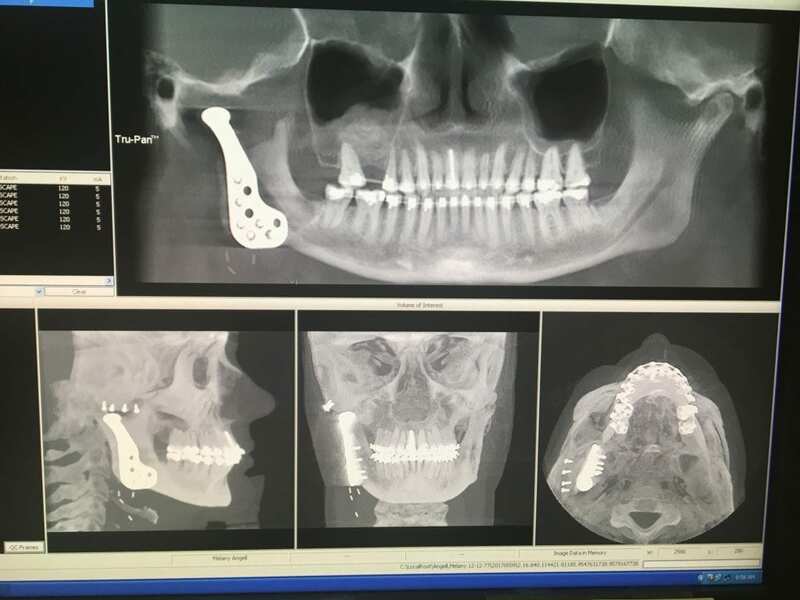 She was placed in orthodontic braces just prior to her TMJ arthroplasty with the plan being to wear these for one year with a concurrent sinus lift scheduled to correct the “abnormal pull on the right side of her face” which had occurred over the past 3 years. The patient’s past medical history had very little bearing on her PT treatment. Her only medication was Gabapentin, 100 mg three times daily and she reported allergies to Percocet and Erythromycin. She received PT prior to her joint arthroplasty for strengthening and stabilization exercises for her TMD symptoms which decreased but did not alleviate her symptoms. After surgery in January of 2017, she requested PT and was referred to our clinic with the only restrictions to avoid mouth opening > 37 mm and no eating steaks or nuts. The patient’s goals were to be able to return to working as a dental hygienist, chew normally without having to place all of her food on the left side of her mouth, be able to sleep on her right side, and to be free of pain while having the stamina to run 5K’s and work up to running a half-marathon. The patient gave written consent for her information, pictures, and videos to be published. The patient’s symptoms had a specific onset after wisdom teeth extraction in 2014. She described her symptoms as headaches and “aching” neck pain with a muscular tightness component. These symptoms were described with the Numerical Pain Scale (NMS) which has been compared and found to be interchangeable with the Visual Analog Scale and the Facial Pain Scale, which have been previously validated with measuring subjective pain in children as well as adults.10,11 The scale is from 0 to 10 with 0 being “no pain” and 10 being “emergency room pain,” and ranged from 0/10 at the least to 4/10 at the worst. Her symptoms increased with cervical extension, driving for long periods of time, picking up heavier objects as well as being worse in the afternoon and decreased with the use of Motrin. There was no change in symptoms with coughing, sneezing, or straining. The patient described her jaw, temporal, and facial symptoms as a “muscular tightness” and felt that if she moved “the wrong way” her jaw would “snap like a violin string.” When described on the Numeric Pain Scale, her symptoms ranged from 2/10 at the least to 10/10 at the worst. This “tightness” worsened with talking, eating, yawning, eating tough or chewy foods, and eating hard foods. This symptom was worse in the evenings. It lessened when chewing on the contralateral side, taking Motrin, applying ice and/or heat, and resting her jaw. The patient’s right arm symptoms traveled to the 4th and 5th digits in an ulnar nerve distribution and were described as “burning” and “tingling” with a feeling of weakness. When described on the Numeric Pain Scale, her symptoms ranged from 0/10 at the least to 4/10 at the worst. The symptoms increased with lifting heavy objects and while driving in a “10:00 to 2:00” hand position but lessened with frequent position changes. This right arm symptoms worsened as the day progressed. Functionally, she reported changing the way she ate and was unable to exercise due to her symptoms. She stated her pain was beginning to improve after the joint arthroplasty surgery versus the previous 3 years of pain. The patient’s quality of life and biopsychosocial factors were scored utilizing the TMD Oral Health Impact Profile (OHIP), which has shown “good content, face and known groups validity” when assessing these qualities of TMD.12 The TMD OHIP is broken into 7 categories (Table 1) for functional limitations, pain, discomfort, physical and psychological disability, social disability and handicap. The patient’s exam outcomes are detailed in Table 2 and x-ray imaging can be seen in Figures 1 and 2. This patient was 4 months status post right TMJ arthroplasty. Her condition was complicated by a previous MVA affecting her cervical spine and right upper extremity. The patient was evaluated, and the PT treatment approach was discussed on the initial visit. It was determined since the patient would be driving 1.5 hours to come for treatment, she would only be seen one time a week for 60-90 minute treatments, and would be responsible for performing a home exercise program (HEP). She was seen for evaluation and 10 treatments over a 3 to 4-month period. A detailed explanation of the treatment sessions are discussed in Table 3. She received manual therapy of soft tissue mobilization for 45 minutes at each treatment to decrease muscle tension and pain.13 Following this, she received joint-specific treatment for improving cervical and thoracic segmental mobility.14 She received one treatment of joint specific treatment to the TMJ at grade I-II for pain relief in an anterior-inferior direction. Manual therapy and exercises were followed by sensorimotor control activities to improve patient’s coordination and stabilization of musculature with concentration on the deep neck flexors and use of laser for biofeedback.15–18 The patient was asked to place her tongue-to-palate for recruitment of tongue musculature while performing deep neck flexor activation with simultaneous opening and closing of her mouth tracing a vertical line with the laser beam (Figure 3a). Additionally, the treatment focused on cervical and thoracic spine segmental mobilization to address motion limitation (Table 3). The patient was seen for an evaluation and 10 PT treatments. She was assessed with the OHIP TMD profile to determine her physical, psychological and functional disabilities, with scores improving from 80% disability to 34% disability. The subscales and their scores are listed in Table 1. The patient’s jaw opening improved from a 27 mm with 7 mm right lateral deviation to 32 mm opening with 1 mm right lateral deviation. 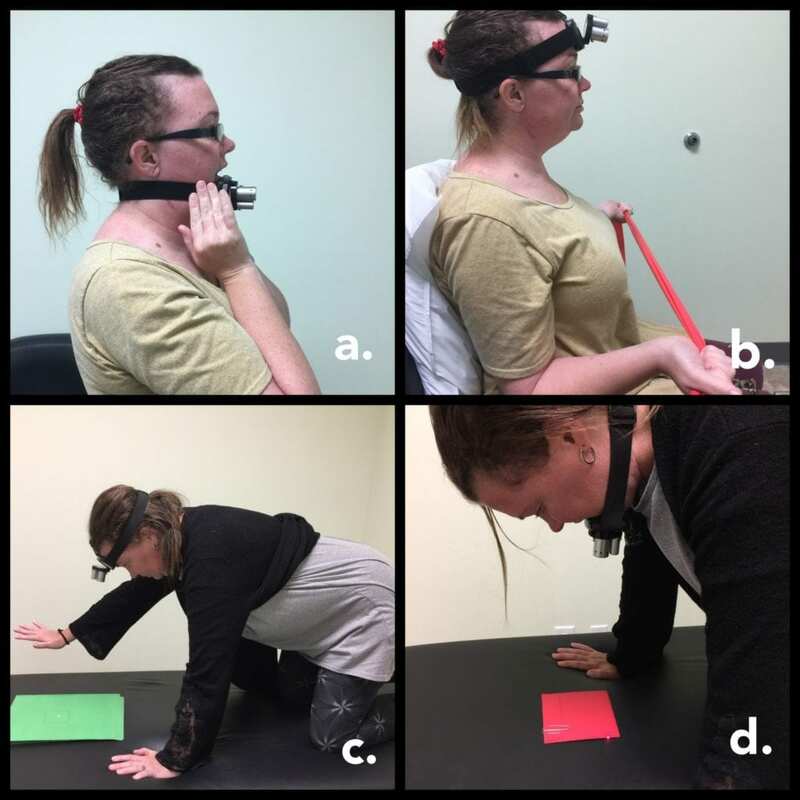 Her neck flexor endurance test improved from 8 seconds to 24 seconds in the test described by Domenech et al.19 The patient’s cervical segmental mobility normalized bilaterally. Her cervical motion improved to normal and pain-free. Her neural tension test for the right median nerve, which was positive at evaluation, was not painful at the end of treatment. All muscular tension symptoms the patient experienced in her face, head, upper trapezius, and rhomboids were alleviated. A year after discharge, the patient reports being able to jog 2 miles with a frequency of 3 times per week. She is working full-time as a dental hygienist. She is able to eat as she desires and is able to sleep on either side without symptoms. She is bothered slightly by long work hours but these symptoms are relieved by ibuprofen. The uniqueness of this case report and its outcomes lie not only in the use of the laser at the jaw for sensorimotor control but also the employment of a tongue-to-palate strategy during exercises. The exercises progressed in difficulty, challenging the feed-back loop with the desire to affect the feed-forward look. The laser exercises utilized extrinsic feedback in order to make an effect on the patient’s intrinsic feedback. The results were seen objectively with improvement in the patient’s neck flexor endurance time as well as a reduction of lateral deviation with jaw opening. It is felt that the combination of manual therapy, exercises, and sensorimotor control exercises provided the framework for recovery in this case. 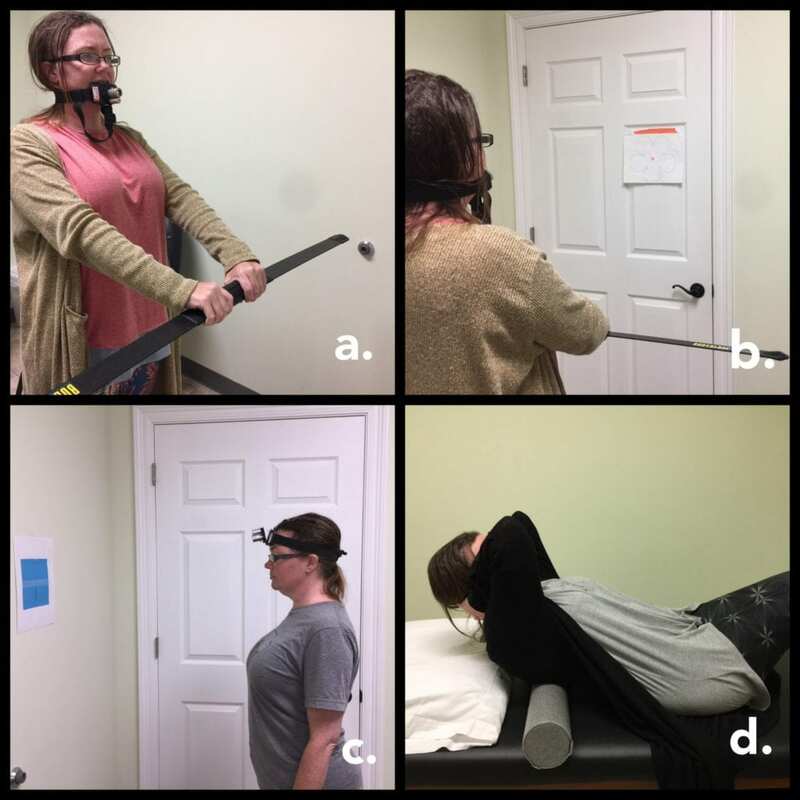 Future trials are needed to evaluate the effectiveness of treatment of patients following TMJ arthroplasty, which include postural education, manual therapy and motor control and endurance exercises. Physical therapy is a discipline that treats musculoskeletal deficits throughout the body; however, the diagnosis of TMJ arthroplasty has minimal literature defining treatment and PT outcomes. This is the first case report to discuss the motor control component of rehabilitation through the use of laser for biofeedback. 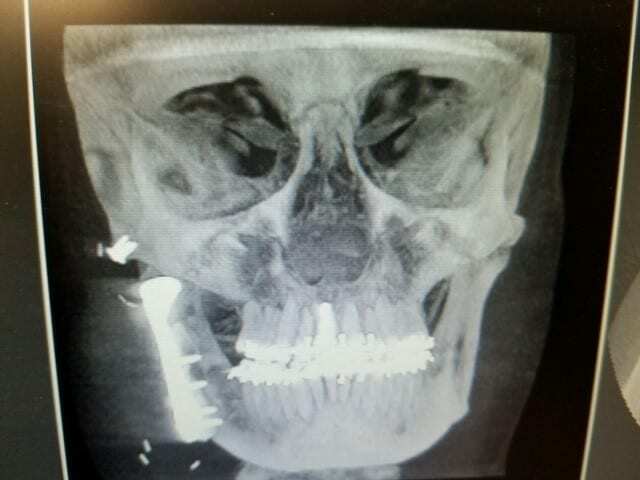 The lack of motor control, as noted by the patient’s 7 mm lateral deviation with mouth opening, improved from a status of “uncorrected” to a status of “straight” according to the DC-TMD. The use of the laser system could explain this corrected position with mouth opening, and exercises that focused on the motor control aspect of the task. However, further research is warranted to investigate 1) the mechanism of action of the tongue-to-palate maneuver in patients with cervical spine and TMD dysfunctions; and 2) muscle activation and sensorimotor control processes that occur during laser exercises when the positioning of the device is moved from the forehead to the lower jaw (Figure 3a, 3d, 4a). 1. Fernández-de-las-Peñas C, Mesa-Jinénez J. Temporomandibular Disorders: Manual Therapy, Exercise and Needling. Edinburgh, Scotland: Handspring Publishing; 2018. 2. Lipton JA, Ship JA, Larach-Robinson D. Estimated prevalence and distribution of reported orofacial pain in the United States. J Am Dent Assoc 1939. 1993;124(10):115-121. 3. de Leeuw R, Klasser G, eds. Orofacial Pain: Guidelines for Assessment, Diagnosis and Management. Sixth Edition. Hanover Park, IL: Quintessence Publishing; 2018. 10. Jaywant SS, Pai AV. A Comparative Study of Pain Measurement Scales in Acute Burn Patients. Indian J Occup Ther. 35(3):13-17. 11. Fadaizadeh L, Emami H, Samii K. Comparison of visual analogue scale and faces rating scale in measuring acute postoperative pain. Arch Iran Med. 2009;12(1):73-75. 14. Gross AR, Hoving JL, Haines TA, et al. A Cochrane review of manipulation and mobilization for mechanical neck disorders. Spine. 2004;29(14):1541-1548. 20. Pinsault N, Vuillerme N. Degradation of cervical joint position sense following muscular fatigue in humans. Spine. 2010;35(3):294–297. http://journals.lww.com/spinejournal/Abstract/2010/02010/Degradation_of_Cervical_Joint_Position_Sense.8.aspx. Accessed August 16, 2017. 21. Forestier N, Teasdale N, Nougier V. Alteration of the position sense at the ankle induced by muscular fatigue in humans. Med Sci Sports Exerc. 2002;34(1):117-122. 23. Riemann BL, Lephart SM. The Sensorimotor System, Part II: The Role of Proprioception in Motor Control and Functional Joint Stability. J Athl Train. 2002;37(1):80-84. https://www.ncbi.nlm.nih.gov/pmc/articles/PMC164312/. Accessed February 25, 2018. 27. Hiiemae KM, Palmer JB. Tongue movements in feeding and speech. Crit Rev Oral Biol Med Off Publ Am Assoc Oral Biol. 2003;14(6):413-429. 29. Mathiowetz V, Kashman N, Volland G, Weber K, Dowe M, Rogers S. Grip and pinch strength: normative data for adults. Arch Phys Med Rehabil. 1985;66(2):69-74. TABLE 1: Outcomes of the Oral Health Impact Profile (OHIP) for TMDs. TABLE 2: Outcomes of the Physical Therapy Examination. Observation Forward head, rounded shoulder posture. Slight drooping of right eyelid is noted. Decreased facial wrinkles noted with a decrease in lip elevation on the right with smiling and raising of eyebrows. Jaw muscles assessed gently – patient was able to give a small amount of resistance without pain. TABLE 3: Description of treatment sessions. 5 Soft tissue mobilization as described on previous treatment (treatment time: 45 minutes). Exercises of TROM with right SCM isometrics 10 second hold x 10 reps, laser at forehead: TROM with DNF in quadruped position 10 second hold x 7 reps, laser at jaw: quadruped with ROM and jaw open/close x 15 reps, laser at forehead with quadruped with TROM and alternating UE elevation 6 second hold x 10 reps, thoracic extension gliding over OPTP roll (Figure 4d) to upper and mid-thoracic spine (exercise treatment time: 45 minutes). Manual therapy of downslides in supine to C2-7 segments on the left (treatment time: 10 minutes). HEP: thoracic extension gliding over OPTP roll daily at home to upper and mid-thoracic spine. 6 Soft tissue mobilization as described on previous treatment (treatment time: 45 minutes). Exercise consists of thoracic extension gliding over OPTP roll to upper and mid-thoracic spine, DNF w/ TROM 10 second hold x 10 reps, laser at forehead with quadruped with TROM and alternating UE elevation 6 second hold x 20 reps, laser at jaw: quadruped with ROM and jaw open/close 3 x 10 reps (treatment time: 45 minutes). Manual therapy of downslides in supine to C2-7 segments on the left (treatment time: 10 minutes). 7 Soft tissue mobilization as described on previous treatment (treatment time: 45 minutes). Reassessment completed with improvements noted in mouth opening from 27mm to 32mm with a reduction in right deviation from 7mm to 1mm. Pt continues to have pain but the intensity is less. 8 Soft tissue mobilization as described on previous treatment (treatment time: 45 minutes). Pt has missed a few treatments due to vacation and required another reassessment. 10 Soft tissue mobilization as described on previous treatment (treatment time: 45 minutes). Manual PA at thoracic spine T2-7 grade III-IV, rib costotransverse mobilization on R Ribs 3-6 in prone, 1st rib mobilization at costotransverse and costovertebral grade III-IV in supine (treatment time: 30 minutes). Moist heat to cervical spine and thoracic spine and pre-modulation e-stim (low beat) to thoracic spine (T2-10) to modulate the sympathetic nervous system x 15 minutes. FIGURE 3. Stabilization and motor control exercises for TMJ. 3a. Jaw opening/closing on horizontal line with laser at jaw. 3b. Cervical stabilization with laser at consistent point while performing a dynamic arm activity. 3c. Quadruped alternating arm elevation with chin tuck or deep neck flexor activation with tongue-to-palate. 3d. Quadruped deep neck flexor while performing jaw opening/closing with laser at jaw and tongue-to-palate.